Most television pilots are about putting things together. 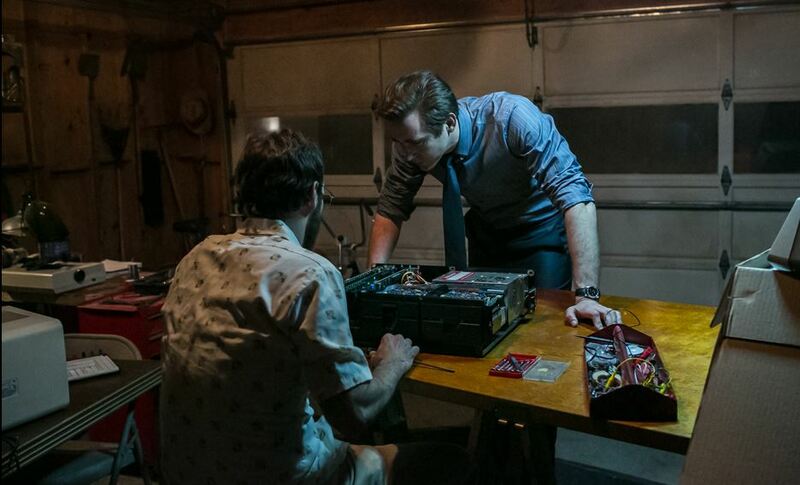 By contrast, the key scene in the premiere of Halt and Catch Fire (airing Sunday night at 10 p.m. ET on AMC) concerns taking something apart. Slickster visionary Joe MacMillan (Lee Pace) and engineer/frustration volcano Gordon Clark (Scoot McNairy) have barricaded themselves inside a garage for a long weekend with the goal of “reverse-engineering” an IBM PC. It’s 1983, deep in the heart of Texas, and while International Business Machines has the most successful personal computer on the market, it’s far from the best. In order to turn their company, sleepy Cardiff Electric, into a major player, Joe and Gordon need to find out, once and for all, what makes the big boy tick. It’s a mildy diverting spectacle, the sight of Pace and McNairy — the former fashioned like a Maxell ad, the latter rocking the sort of eyeglasses preferred by Terry Richardson and/or your great-grandfather — searching for an original needle in a highly flammable haystack. But it’s an excellent metaphor for the current state of the TV drama business. With actual creativity unable to keep up with demand, networks are increasingly soldering together borrowed concepts with all the subtlety of a Tandy assembly line. AMC has been particularly guilty of this. Last summer’s Low Winter Sun was antihero lite, and its current effort, Turn, while perfectly decent, has yet to rise above its recombinant hook (period piece + spies). The network’s once-promising future appears equally muddled. With spinoffs from both The Walking Dead and Breaking Bad on the horizon, the brightest lights of AMC’s upcoming slate are actually mere reflections. Which is why I was pleasantly surprised to discover that Halt and Catch Fire — named for an insidery geek joke about self-destruction — has real spark. I mean this literally, as Joe and Gordon’s electrical poking nearly burns down the latter’s house, but also figuratively. For reasons known only to the network — reasons that suggest a worrying lack of confidence in its product — AMC has made only the pilot available to critics. To pass judgment on a series from a single hour would be like rating an operating system on the boot-up screen. But I like what I see so far. Halt, created by Christopher Cantwell and Christopher C. Rogers, lifts dependable circuitry from plenty of known sources: the competitive fire of The Social Network, the period drabness of fellow ’80s baby The Americans. In the relationship between charismatic Joe and seething Gordon there’s a hint of Breaking Bad’s unhealthy, two-headed ambition. (It helps that Breaking Bad producers Mark Johnson and Melissa Bernstein are involved here too.) The most original thing about it might be its point of view: In 2014, it’s refreshing just to have a new drama devoted to the hard work of collaboration and creation, not the easier thrills of violence and decay. But the proprietary code here, the ghost inside a recognizable machine, is the cast. Halt is elevated from its opening frames by its actors, nearly all of whom could carry their own show. Together, they upgrade Halt’s early exposition from stuttering DOS to a purring mountain lion. As Joe, a Draperesque mystery man in a suit, Pace is as slippery as hair gel. He’s Steve Jobs’s raging id, his greed to think different unfettered by morals or posters of Gandhi. Pace’s breezy avarice is well-matched with McNairy’s tightly coiled zeal. His Gordon is a would-be Wozniak who missed his moment. Instead of leading a revolution, he’s toiling in check-cashing obscurity, alternately resenting and clinging to his family for support. Thankfully, said family is more than just a collection of anthropomorphized buzzkills. Donna Clark is a savvy engineer in her own right and, as played by the wonderful Kerry Bishé (best known for playing McNairy’s spouse in another period piece, Argo), she comes across as a realist, not a scold. Computers are her dream business too; she’s just more focused on the unforgiving hardware of her actual life. Halt and Catch Fire’s killer app, though, is Canadian actor Mackenzie Davis as punk programmer Cameron Howe. With a hairdo and attitude on loan from Some Kind of Wonderful, she’s the jolt of electricty that powers the entire pilot. When she meets Joe in a bar, she matches him shot for shot. When an arcade manager gets wise to her lo-fi cheat code (by attaching a quarter to a string, she can play Centipede all day), she punches him in the chest and calls him a fascist. Halt’s drive only really starts spinning when Joe’s extralegal shenanigans get Cameron employed at Cardiff and tasked with restarting the entire company while both IBM’s powerful legal team and Cardiff’s own furious cowboy boss breathing down her neck. It’s a lot of pressure placed on Cameron’s narrow shoulders, but no more than what AMC is expecting of the series as a whole. It will take a few more episodes to tell if Halt is able to rise above its basic “innovation vs. suits” binary. (And hopefully it will take a few steps away from the grim direction of Juan José Campanella. His vision of Texas’s Silicon Prairie is plenty grungy — you can smell the tequila sweat rising off the characters — but lacks the contrasting gleam of optimism necessary for such a cerebral, forward-thinking story.) But Halt has earned both my interest and my patience. Actors this good deserve a showcase, and AMC viewers deserve a show that respects brains for their content, not their calorie count. Computers have changed the way we watch TV but, until now, TV has remained oddly incurious about where computers came from and what their rise might mean. I’m not sure if Halt and Catch Fire is that show — after all, AOL chat rooms won’t even be invented until Season 10 — but it could be. Here’s hoping Halt can hack it.